A novel production method for two-dimensional (2D) nanosheets has been developed by a research team led by the Department of Energy's Oak Ridge National Laboratory. In this new method, nontoxic liquid nitrogen is used to separate bulk materials to produce the 2D nanosheets. This process is an environmentally friendly approach that increases the surface area of the material by 20 times per sheet, thus further expanding the commercial applications of the nanomaterials. It’s actually a very simple procedure. We heated commercially available boron nitride in a furnace to 800°C to expand the material’s 2D layers. Then, we immediately dipped the material into liquid nitrogen, which penetrates through the interlayers, gasifies into nitrogen, and exfoliates, or separates, the material into ultrathin layers. The potential applications of boron nitride nanosheets include separation and catalysis, for example, converting carbon monoxide into carbon dioxide in gasoline-powered engines. They may also be used as an absorbent to clean up hazardous waste. 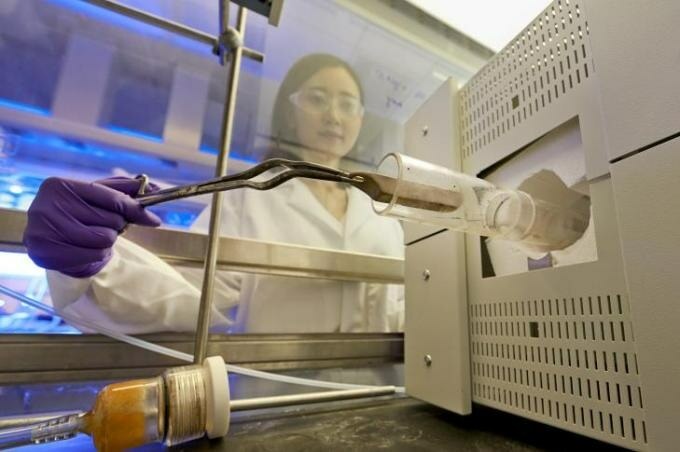 According to Zhu, the controlled gas exfoliation process developed by the research team holds promise for synthesizing other 2D nanomaterials like graphene, which has potential for use in water purification, electrodes, photovoltaics, and semiconductors. Since one-atom-thick 2D nanomaterials are versatile and have huge commercial potential, researchers are exploring more efficient methods to make larger sheets. Zhu explained that harmful chemicals used in current exfoliation methods generate hazardous byproducts and decrease the amount of surface area per nanosheet. In this particular case, the surface area of the boron nitride nanosheets is 278 square meters per gram, and the commercially available boron nitride material has a surface area of only 10 square meters per gram. With 20 times more surface area, boron nitride can be used as a great support for catalysis. The research team plans more research aimed at expanding the surface area of the nanosheets of boron nitride and also testing their feasibility in removing engine exhaust and increasing the efficiency of hydrogen fuel cells. Other co-authors on the paper titled, “Controlled Gas Exfoliation of Boron Nitride into Few-Layered Nanosheets,” include ORNL’s Sheng Dai, Xiang Gao, Qian Li, Shannon M. Mahurin and Wenshuai Zhu; Yanhong Chao, Hongping Li and Huaming Li with Jiangsu University and Meijun Li from the University of Tennessee. The study findings can be found at http://onlinelibrary.wiley.com/doi/10.1002/ange.201605515/abstract. The DOE Office of Science supported the study. The Liane Russell Distinguished Early Career Fellowship provided additional funding through the Laboratory Directed Research and Development program. In 2014, Zhu joined as one of the first Russell Fellows of the lab, and her area of focus is on synthetic control of hybrid nanomaterials for use in catalytic applications.